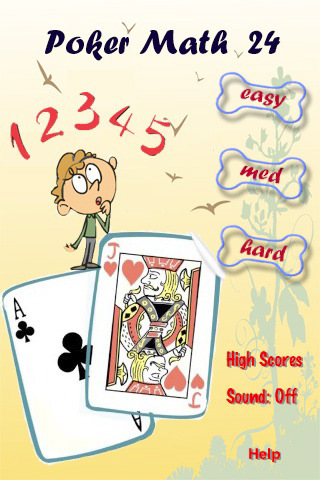 The Poker Math 24 iPhone app is a great way to enhance your mathematics skills while still having a blast. This is one of those poker apps that really gets your brain moving and causes you to find an answer using simple equations. The basis of the game centers around four cards that are initially given to you that you have to organize and put together using math equations to equal the number 24. This may sound simple but it can actually be quite challenging. There are three different levels of difficulty that you can participate in and each one gets quite a bit harder. Do you think you have what it takes to master all of the equations and post the highest score? If you do then you should download the app today, get on the leader boards, and set your sights on that number one rank! The Poker Math 24 app is not really a poker game at all, but really just uses it as an avenue to help you get your math brain working. The game is still surprisingly fun as it offers quite the challenge when you have to try and decide what math equations to use in order to get the appropriate answer. Voted 4 1/2 stars by iPhone poker app users and currently costs $0.99 to download.